"I have been with horses for a very long time, I used to come here for competitions since 1962, many times I was a winner. I was riding for Lithuania abroad and now I am the oldest rider, I am 72 already." "I don't know how to say it better, I am a very strong fan, i always support this competition." "I was very worried, feel very tired. Today i had five starts and won three of them, once i came third. Tired from worrying so much, from responsibility. Main start wasn't good for me, on the corner i was the last. (but won in the end)"
"I was confused, thought it my performance would be worse, didn't know exactly what to do, i am only riding for the forth time, didn't even expect such finish." Thousands of equestrian sports enthusiasts descended on the banks of Lake Sartai in northeastern Lithuania to watch horse races on ice. On the first weekend in February ( 02 - 05 February 2006) people from across the country gathered to enjoy Lithuania's favourite sport, watch dancers and listen to traditional music. Chariot racing is among Lithuania's favourite sports. Thousands of spectators gathered in the Zarasai region, which is 130 km (80 miles) from Vilnius, to bet on their favourite horses. Sartai Winter races date back three hundred years. 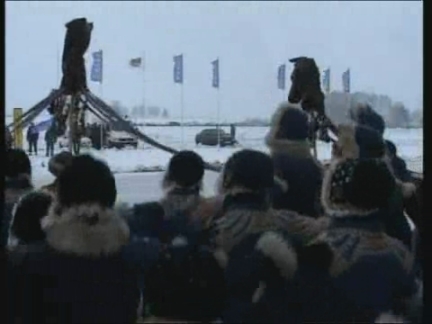 Locals celebrate the winter by staging chariot races and competitions on the ice. Harsh icy winters prompted locals to set up horse races on ice to test horse riders' abilities and entertain locals. Horsemen and women aged between 18 -70 years compete on ice tracks rather than on conventional turf courses. Well-groomed horses and racers in their carriages ride as fast as they can to win the prestigious competition and its prize. Riders race around a 1km (0.6 miles) ice track over ten races to win the grand prize of 2000 Euros (2,590 US Dollars). Races last only two or three minutes,and horses pick up speeds of 40 - 50 kilometres per hour (24 -31mph). Horse riders believe the winter course is the best test of a jockeys skills. The slippery ice surface creates greater challenges for the jockeys. Riders have to keep their chariots on course whilst controlling the horse galloping. 72 year old Alfredas Zarnaukas has been taking part in Sartai races since 1962. He has won many ice races and even went abroad to represent Lithuania horse racing. Now he is the oldest participant in the race. Zarnaukas says he's been around horses all his life and loves taking part in the competitions. Algis Vilkinis, is this year's winner of Sartai race with a result of 2 minutes and 7 seconds. Vilkinis received 2000 Euros (2,590 US Dollars) and a cup from the agriculture ministry. Vilkinis says his start was bad but he won the race on the last corner. 14 year old Albinas Drota was the youngest participant and received a frozen turkey for winning his race. Drota says it was only his fourth race he has competed in and did not expect to win. Chinese Dawazi performer (tightrope walker) Saimaiti Aishan on Saturday failed to walk across a wire suspended 100 metres (328 feet) above the ground between two hot air balloons. Saimaiti undertook the challenge on Saturday morning in China''s Hunan Province. He failed to travel the wire''s 15-metre (49-feet) distance due to a strong air current, losing his balance but managing to hang onto the wire by wrapping his arms and legs around it. Saimaiti then hung on one hand and pulled himself back up onto the wire. Despite failing the challenge Saimaiti finished the journey. The balloons descended to a height of 30 metres (98 feet) and Saimaiti made it across the wire to the safety of one of the hot air balloons. "For me it's great fun here, everybody should have fun in this place but the players and especially the coaches are very nervous and they want to show their best, so the fun is a bit off side." Just a week before the kick of of the world's most famous sporting events - the football World Cup in Germany - the final of an unofficial "World Cup" football tournament called FIFI took place in Hamburg. 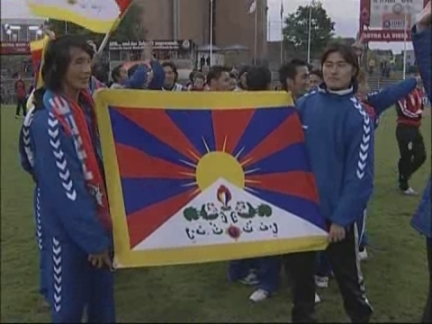 Tibet, Greenland and Zanzibar were just some of the teams taking part in the unofficial "World Cup" event staged by FIFI (The Independent Football Association). Other participants included teams from Gibraltar, Tibet and Greenland. Not officially recognised by FIFA and therefore unable to access the official world championship event they set-up their own "World Cup". Teams representing Turkish Northern Cyprus and Zanzibar qualified for the final. With footballers arriving by parachute, the tournament showed the humorous side of the game. But for the teams taking part in the final, it was a serious match. "For me it's great fun here, everybody should have fun in this place but the players and especially the coaches are very nervous and they want to show their best so the fun is a bit off side," said Elton, FIFI tournament director. After 90 minutes of play, Turkish Northern Cyprus won 4-1 on a penalty shoot-out. This was FIFI's first World Cup tournament but organisers are hoping there will be more in the years to come. The final coincided with Hamburg's love parade taking place just outside around the stadium with music and dancing expected to go on late into the night. UPSOUND: (English) Actress "he has been twenty minutes like this... do something"
"The European teams are very accurate, the Americans teams or the Canadian team work very strictly by the book, and it is amazing to see it. This is something we have to learn from them. The Israeli groups are very fast and efficient and they work by the feeling, they feel the patient and they react"
"can we get a ventilator, an automatic ventilator ? " 22. Cutaway of sign on ambulance reading: "Czech Republic"
"Israeli MDA (paramedics) is more experienced in the mass disasters, the trauma, like shotguns and so. We don't have this. We have accidents and we have usually cardiac problems, because we treat old people in Prague and usually there us hypertension, heart failure and so this is our job"
"I can not say I am the best and I can not say I am the worse. You know? Just I hope to be good, yes"
"It is the first time that we participate in this championship but I think we can learn quite a lot from it for next time and next time we come here then we go for the championship (laughing)"
Paramedics are usually the first emergency services on the scene after an accident, disaster or other emergency. Every day they test their skills in an effort to save lives. And now they are competing to win the prize of International Paramedic champions, plus share knowledge and techniques with colleagues from across the world. In a remote location in southern Israel near the Dead Sea, 180 paramedics from 13 countries are competing in the second international EMS championship (September 7-10) organised by the Israeli EMS (emergency medical services) organisation. The paramedic teams from each country are given different scenarios that they must react to as if the incident had really happened. Their work is assessed by a team of judges, according to different criteria such as speed, cooperation, number of mistakes and so on. 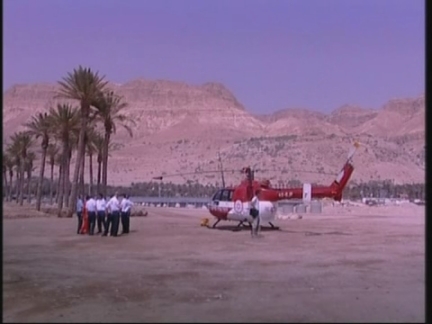 The incident stations were located in various places around the Dead Sea and the crews were also tested on their ability to navigate their way with a map in an unfamiliar area. Actors and mannequins awaited the teams in each station acting out a different scenario such as gas explosion, car accident and leopard attack. The crew had to react to the scenario, locate all the patients and give them the right treatment. The judges were watching them all the time, writing down evaluations of their team work and efficacy. The judges were able to observe the different ways the various nationalities tackled the same task. One of the judges, Eyal Zehavi, who is also an Israeli paramedic, says that the European and North American teams were very precise, whereas the Israelis were fast. Tomas Carnal, a paramedic from Prague in the Czech Republic, says that he is more used to dealing with heart problems, than disasters. The Israeli paramedics are known locally as MDA, which stands for the Hebrew words "Magen David Adom" which means Red star of David. In addition to learn new techniques from their colleagues the teams had another goal .... winning. Didier Fagegaltier, a doctor from the French EMS, says he hopes to do his best. Gerda Van Maaren, a Dutch paramedic, says this is her team's first time taking part in the championship, but next year they hope to aim higher. International competition for ALS (Advanced life support) the Polish team. National (Israeli teams) competition for ALS (Advanced life support) the Israeli team from Carmel region. BLS (Basic life support) - this was judged for all together because only one foreign team from Norway participated and the winner was an Israeli team from Gilboa region. "You put your snorkel on, your mask on and that''s it. It''s absolutely, completely dark. So it''s very cold and you can hear people cheering for you which you need. But it''s an awful long way down there, it''s an awful long way and so you really wonder if you''re going to make it. It''s much more tiring than it looks." "Basically, there is nothing to prepare you for a bog. I''m not sure Australia''s a pretty big country and I''m not sure there''s a bog from one tip to the other." "Training, training is very important - both aerobic and anaerobic. Find yourself a good team. What else have you got to do? Eat lots of sweets. Carbo-loading is the answer to everything. That''s what has me the way I am today." "That was absolutely fantastic. I dedicated that race to my family back on the East Coast of the United States." "It''s very cold, it''s eleven degrees (Celsius, 51 degrees Fahrenheit) constantly, lots of scorpions, eels, lots of creepy crawlies in the bog. And it''s a peat bog so your legs go like lead when you get half way down and you''ve got to breathe really slowly through the snorkel. You''ve got to do sixty yards (54 metres) there and back without lifting your head out of the water. It''s really tough." "I just think it''s something quirky, something different. People have such serious lives, they need to let their hair down and where else could you win a world record?" "I mean I''ve got the bit between my teeth now and I''m sure I''ll come back next year and clean up the competition, it''s a bit of a recce (meaning reconnaissance mission) this year!" "You can''t see, you can''t see a thing. It''s so cold you can''t breathe properly. It is just painful." "Thank you. Oh wowee (kisses medal) and all that." Britain may be preparing to host the Olympic Games in 2012, but one sport that certainly won''t be featuring is bog snorkelling. It involves swimmers, complete with mask and snorkel, racing in trenches cut into muddy peat bogs. Some 200 bog snorkellers took part in the World Championships in the tiny Welsh town of Llanwrtyd Wells (Pronounced: CLAN'' - twid Wells). This man is putting on his mask and snorkel and adjusting his wig in preparation for his swim in the World Bog Snorkelling Championships 2012. The fields of the Llanwrtyd Wells, officially the smallest town in Britain, are an unlikely setting for this unusual sporting events. Every year the World Bog Snorkelling Championships attract huge interest from across the globe. Over the last 26 years competitors from Australia, Germany, Spain, France, Italy, Poland, South Africa, and the USA have all plunged into the murky bog in an attempt to become bog snorkelling champion of the world. Bog snorkeller Anthony Bell explains how it is done. Fellow competitor Mark Swivell says it is unlike anything he has done, anywhere in the world. The dense Waen Rhydd peat bog is regarded as having the perfect conditions to cut the special 60 yard (55 metre) trench in which the swimmers race in the murky waters. The experience is described as like trying to swim through thick pea soup. Competitors range from the young to the old and everyone is required to wear a mask and snorkel, but fins or flippers are optional - as is fancy dress. Bog snorkeller Julia Galvin says there are some things she does in preparation for the big event. While John Lund, says he has come all the way from the USA to take part. There are strict rules for competitors with no recognised swimming strokes allowed - only doggy paddle is permitted. Swimmers are only allowed to raise their heads from the dirty waters for orientation. The race takes place over two lengths or a total of 120 yards (110 metres) and the fastest person at the end of the day is declared the World Champion. Event organiser Sheila Tompkins says the competition is not for the faint hearted. The current world record stands at one minute 30.6 seconds, and was set at last years championship. The competition in 2011 is extremely tough however, as the extreme swimmers battle it out for first place. Tomkins says it appeals to those looking to do something a bit different. Bog snorkeller Mark Swivell says he hopes to win the competition next year. Over 200 competitors raced on the day and eventually a first timer from Yorkshire in northern England was declared the winner with a world record breaking time of one minute twenty four seconds. Bog snorkelling World Champion Andy Holmes says his win was not easy. Competitor Julia Galvin says she is delighted to receive her medal for taking part. After it is all over, many of the competitors head off to the local pub for a well earned a drink with many saying they''ll be back next year for another crack at what could be the worlds quirkiest World Championships. Travis Pastrana 'nac-nacs' his way to victory at FMX. Travis Pastrana thrilled the 23,000-strong crowd in Madrid's premeire bullfighting venue on Thursday (15/07) to win the latest edition of the Freestyle Motocross circuit. In his European debut, the 21-year-old American took Las Ventas, Spain's holy site for bullfighting, by storm, leaving fans in no doubt as to why he is regarded as the best Freestyle Motorcyclist in the world at the moment. Not even compatriot Nate Adams' heroic 'Superman backflip', a trick never seen before, could steal the limelight from Pastrana - Adams had to settle for second, with another American, Ronnie Renner, third. Las Ventas, in the Spanish capital Madrid, is the holiest of sites for bullfighting fans. But on Thursday (15/07) fans of a different kind flocked to the arena as the 'X-Fighters' Freestyle Motocross (FMX) circus roared into town. It is the only sport other than bullfighting that has ever been allowed to take place here, and eight of the best riders from all over the world were determined to make use of the opportunity. Spanish favourite Dani Torres was there. No bulls in the arena today. Instead metal monsters snorted around the ring as fans were treated to some awesome aerial displays. The event has been held here since 2001, and has become more and more popular. 23,000 petrol heads crammed into the venue this year, and they weren't disappointed - cue stunts like the 'no-hander', the 'superman', the 'rock solid', the 'tsunami' and the 'kiss of death'. There were plenty of 'supermen' as riders catapaulted 25-metres into the air with the aid of two specially-designed 'kicker' ramps at either side of the ring. But at the end of the awesome display, we were left with just three grand finalists, all of them Americans. Ronnie Renner, Nate Adams and Travis Pastrana, the hottest thing in Extreme Motocross at the moment, would go head to head, wheel to wheel, in the Grand Final as night descended on Las Ventas. Ronnie Renner, nickname 'Who's your Daddy', kicked things off. Winner of two FMX events in 2003, Renner is having a lean year in 2004. The 27-year-old gave a solid performance, grabbing some big air and hitting the traditional backflips but it was only enough for third place. Certainly not Adams' or Pastrana's daddy tonight. Nate Adams then exploded into action, wasting no time in laying down a 'superman backflip'. According to the ring announcer it was the 'world premiere' for this trick - never seen before. A 'superman' is when the competitor launches himself into the air and lets the lower half of his body fly off the motorcycle. But to do it while pulling off a backflip - that is truly heroic. It is even better in slow motion and yet Adams' run was still not good enough for first place. Adams, 'The Destroyer', was himself destroyed by the red-hot Travis Pastrana. Widely regarded as the best extreme motocross rider in the world today, Pastrana left no-one in Madrid in any doubt after this performance. The run was full of original tricks from Pastrana, nickname 'The Gimp'. 'Nac-nac backflips', 'can-can backflips', 'flatspin three-sixty' - it was all there from Pastrana. The 21-year-old wonderkid won his first extreme motorcycling event at the age of 14, and has never looked back. In his European debut he revved things up with an array of original tricks and was the deserved winner of the 2004 X-Fighters Freestyle Motorcross event. On the podium, 'The Gimp' could not mask his delight at the surroundings and his performance. "This was probably the coolest chase, or race event, whatever you call it. This place and this bullfighting arena is probably the coolest thing I have ever done in my life. Low pressure, high fun, high excitement, best riders in the world were here. That's good." Take a bow Mr. Pastrana. 1. 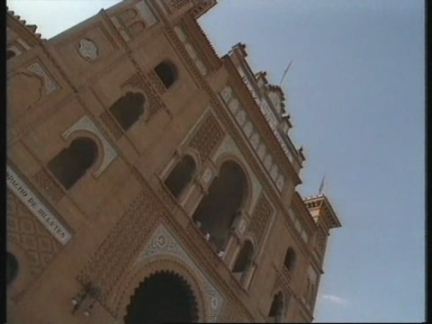 00:00 Exterior shot of bullfighting ring. 2. 00:04 Mid shot of fans gathered outside venue. 3. 00:10 Aerial shot of bullfighting ring. 4. 00:14 Mid shot of crowd chanting. 5. 00:17 Close up of Spanish rider Dani Torres. 6. 00:22 Motorbikes, flanked by trainee bullfighters, come out into the ring. 7. 00:31 Wide shot of motorbikes and bullfighters in ring. 8. 00:37 Motorbike rides past bullfighter with cape. 9. 00:43 Unidentified competitor performing trick. 10. 00:49 Slow motion replay of competitor hitting 'superman' jump. 11. 01:04 Unidentified competitor performing trick. 13. 01:14 Wide shot of bullring ahead of grand final. 14. 01:18 Various shots of Ronnnie Renner's (third place) jumps in grand final. 16. 01:37 Various shots of Nate Adams' (second place) jumps in grand final, including first ever superman backflip (first trick). 17. 01:52 Slow motion replay of Nate Adams' superman backflip. 18. 01:59 Various shot sof Travis Pastrana's (winner) jumps in grand final. 19. 02:11 Close up of spectator applauding. 20. 02:13 Various shots of Pastrana's winning performance. 21. 02:21 Cutaway to crowd. 23. 02:40 Mid shot of Pastrana (left), Renner (middle) and Adams (far right) on podium. 24. 02:45 Close up of Pastrana celebrating. 25. 02:54 SOUNDBITE: (English) Travis Pastrana. 26. 03:06 Slow motion replay of Pastrana in action. "Spectacular. That was one of the greatest wingsuit flights in my entire life. Thank you China, that was amazing." An American professional wingsuit flier on Saturday successfully performed a jump and dive through the Tianmen Hole - an actual hole through a mountain - in Hunan province, central China. The 35 year old American Jeb Corliss jumped from a helicopter 6,000 feet (1,830 metres) above the Tianmen cave, flying towards it, and went right through it. The professional wingsuit flier failed at his first attempt, but succeeded the second time round. "That was one of the greatest wingsuit flights of my entire life. Thank you China, that was amazing," he said after he landed safely. According to Corliss, the first attempt failed due to smoke brackets on his feet that did not work properly and forced him to take a detour. He has become the first wingsuit stuntman to fly in China. Toddlers of all shapes and sizes were on hand for a recent baby crawling derby in New York City. Some prepared for the event with a warm up lap. For others, a nap seemed to do the trick. It's a struggle but someone has to do it. Don't worry. He's just fine. "He did great. He got scared, and now he's going to fall asleep, as you can see." The event was organized by "Babies R Us.' Winner Christopher got a big toy for his efforts. "It's a robot game - the robots are not guided by remote control. They have a little camera in the front and so they can see their surroundings and they can move. They know one goal is yellow and the other blue and the ball orange so they can build a memory." "We came to support our electronic football team and we hope we will win." "This is a product, material for introduction to robotics, for example. The real advantage here is that if you programme it, you can transfer it in a second and you see what the result of your programming is." As the world's best footballers compete in Germany for the sport's top prize, the World Cup, mechanised players in the northern town of Bremen took part in their own competition on Wednesday, a tournament called RoboCup 2006. More than 440 teams from 36 countries will fight for 33 world championship titles at Robocup's tenth anniversary. After 50 years of research within artificial intelligence, it has been determined that robots can be better programmed to play football than the game of chess. In one game, four-legged robots, shaped like tiny dogs, move in unison as they crawl toward the ball. About 2,500 participants from all over the world and 20,000 visitors are expected to take part in RoboCup 2006. RoboCup is an international project to promote artificial intelligence and robotics research. The ultimate goal, or should that be dream, is to develop a team of fully autonomous robots that can win against the human world champion team in soccer by the year 2050.